At Coast Wide Skip Bin and Waste Removal Services our goal is to clean up the South Coast! We want to assist you in helping the environment by reducing the amount of waste going to landfill. We do this by separating real rubbish from recyclable materials at our Huskisson depot. Not only is this great for the environment but it can reduce costs and we pass the saving on to you! Let the Coast Wide Skip Bin and Waste Removal Services crew help you move some rubbish, give us a call today! 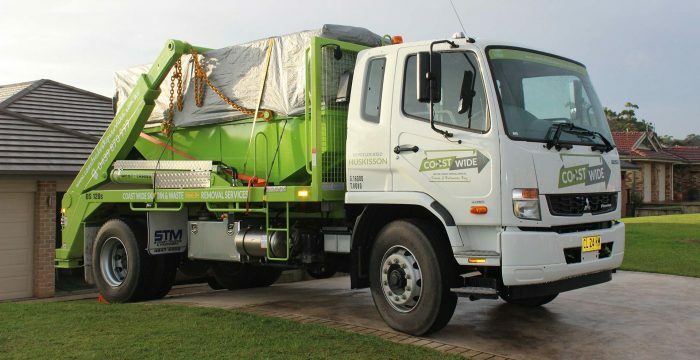 Based in Huskisson, Coast Wide Skips proudly services Kiama to Batemans Bay and all those areas in between, including Nowra, Bomaderry, Berry, Jervis Bay, Huskisson, Vincentia, St Georges Basin, Ulladulla, Milton and more! At Coast Wide we have bin sizes with or without opening barrow doors. 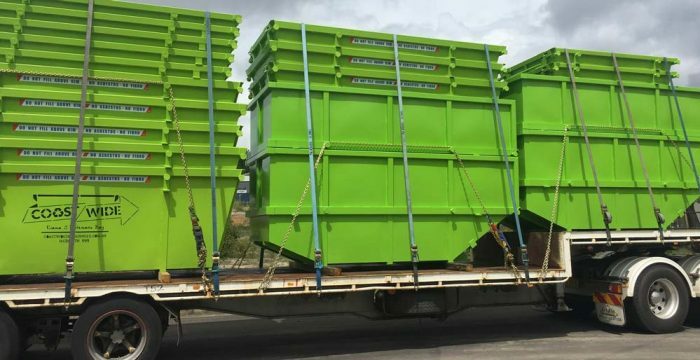 Ever wondered why our skip bins are green? It’s because we try to be too! Coast Wide Skips believes the environment and community will benefit from recycling and reducing landfill and reducing costs. We aim for sustainability and longevity with operating discipline allowing the recycling to grow as population increases. Coast Wide operates all new and up to date equipment this allows us to be reliable and dependable to our valued customers. As stated in our Mission statement we endeavor to recycle everything we can allowing the costs to be reduced in tipping fees and passing these savings onto our customers at a competitive price. At Coast Wide Skip Bin Services we intend to not only provide Skip bin service but also clean ups of rubbish utilising our machines and manpower to provide our customers with a 1 stop shop for rubbish removal. Coast Wide Skip Bin Services is an approved skip business and is fully insured with management plans and WHS standards are adhered to at all times. As our tagline suggests, we service From Kiama to Batemans Bay and all those in between, including Nowra, Bomaderry, Berry, Jervis Bay, Huskisson, Vincentia, St Georges Basin, Ulladulla, Milton and more! We as owners of the business & residents of the Jervis bay area are committed to keeping the area as pristine as ever. Our depot is an approved recycling facility in which we utilise to keep landfill at a minimum. We do this by using and investing in new and waste specific machinery and methods. Our intentions moving forward are to give back to the community via sporting sponsorship and state of the art recycling. Coastwide knows and loves the area and its people. We continue to utilise local suppliers for both business and personal needs. Coastwide Skip Bin Services employ local labour allowing our local community to benefit from a ground up operation. At Coast Wide our intention is total customer service. This starts from the initial 1st point of contact with our customers; what we say we will do, we will do. It will be prompt and reliable with great attention to detail. We at Coast Wide believe without our customers we do not have a business and intend to never lose focus on our customer relations.